Low difficulty – 90 minutes. 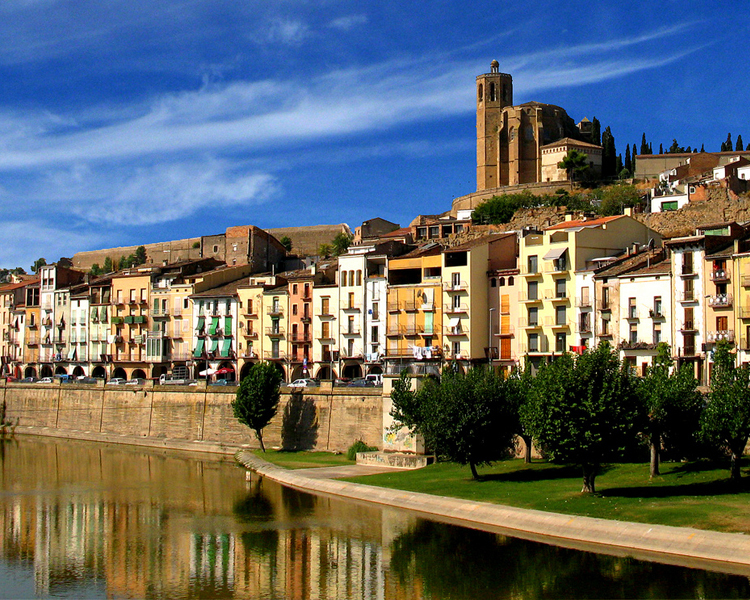 Balaguer is the capital of La Noguera, city accounts, and we will find monuments that show the passage of time and the identity that grants the river Segre. We begin the route fromMarket Square, by its iconic arcades and the market is held every Saturday for more than 800 years. It is located in the old city and among important buildings such as street Botero, where you can admire the Ice Portal and access the rest of the Wall Balaguer,protecting the inhabitants from possible attackers. Continuing the wall, reachthe Church of Santa MariaA majestic architectural work where you can see magnificent views of Balaguer. Just visited the old crossing streets as emblematic as the Barrinou Street, where we find theRegional Museum of Balaguer,Main Street and Down Street known for their business. We will finish the route through the old town square in San Salvador, where we can access Bridge Street where you will find stairs to climbSant CristBalaguer. 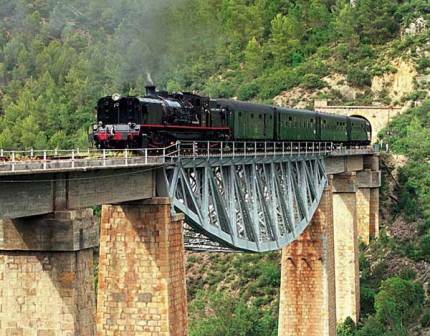 After visiting the shrine, return to Old Bridge where we can enjoy views of Old Balaguer on the caudal Segre and finalize the route Balaguer strolling the gardens of the River Segre shoulder. 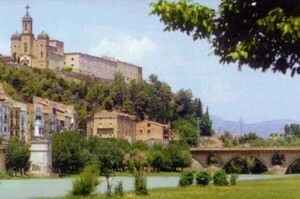 If you have more time, do not miss the Castillo de Balaguer Formós(www.castellsdelleida.com) or Monastery Franqueses(www.monestirs.cat). For more information please contact the Tourist Office of Balaguer, in the square accounts Urgell no. 5, or telephone 973 445 194. Enjoy a nostalgic journey that lets you go back in time, experience for lovers of the railway and the pure nature. It is an unforgettable trip to Lleida lakes to pre-Pyrenees: Train route begins Segrià, Noguera and Montsec crosses and reaches the heart of Pallars Jussà. The closest apartment to start the route is the train station of the city of Balaguer. The route takes us into the past with all the splendor and charm of its own station with two diesel locomotives 10817 and 10820, and dragging wagons fourth time, and offers landscapes where nature with its diversity of colors, we fall in love and give us feelings of freedom. Check fares, schedules and reservationswww.trendelsllacs.cat or phone 933 664 553. 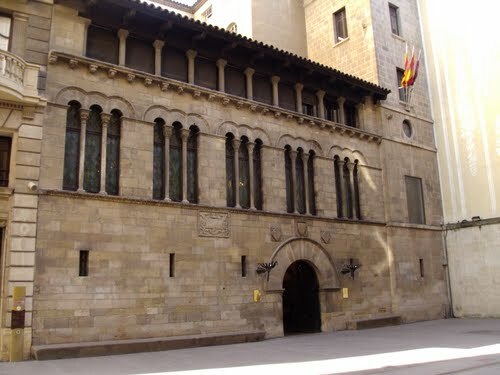 Lleida ciutat: The Paeria Palace is building civil Romanesque most important of Catalonia. Currently there are Lleida City Council, located in the heart of the commercial. Highlight the file municipal hall of the Altar and La Morra (located in the basement, the name by which it is known that the chamber was used for prisoners sentenced to death). The hill of the Old Cathedral is one of the best vantage points of the city, where you can visit the iconic Cathedral of the Old . This building dates from the thirteenth century and although there prevails Romanesque Gothic vault in the stand. Other distinctive features are the heart, and the Altarpiece Tapestry exhibition dating back to the sixteenth century. Also you can visit Roman ruins and medieval churches, baths or Andalusian feudal remnants of the wall. 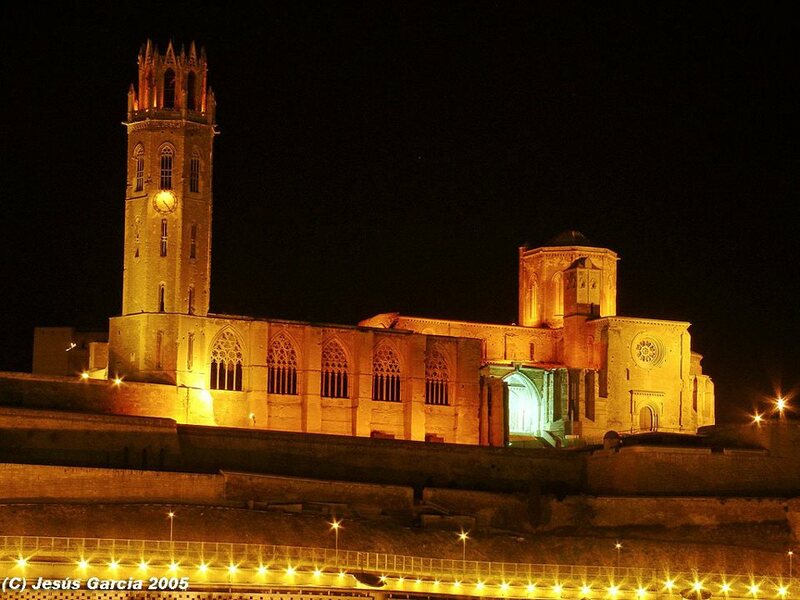 We suggest some routes to discover and get to know the city, from the most important monuments, including the most everyday elements showing lively, cultural Lleida. Find all information:www.turismedelleida.com or phone 902 250 050. The Ivars and Vila-sana has a water surface of 126 ha. 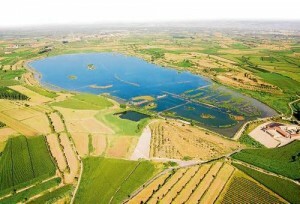 It is the largest lake inside Catalonia in terms of size. Today it is a freshwater lake, although its origin is endorheic. 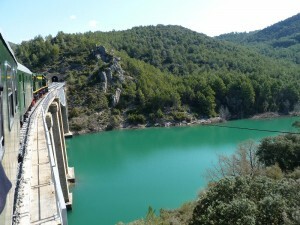 The incoming water, following the recovery project that it has executed comes from the Urgell canal. It’s one of those places that amaze us by its natural charm. With abundance and diversity of flora and fauna that will reach the lake we see his glory. There you will find viewpoints, hides, bridges, rest areas and information panels on the flora and fauna that inhabit it. To fully enjoy your visit we recommend you go prepared with fresh drink to spend a good time and binoculars to enjoy the views and wildlife. 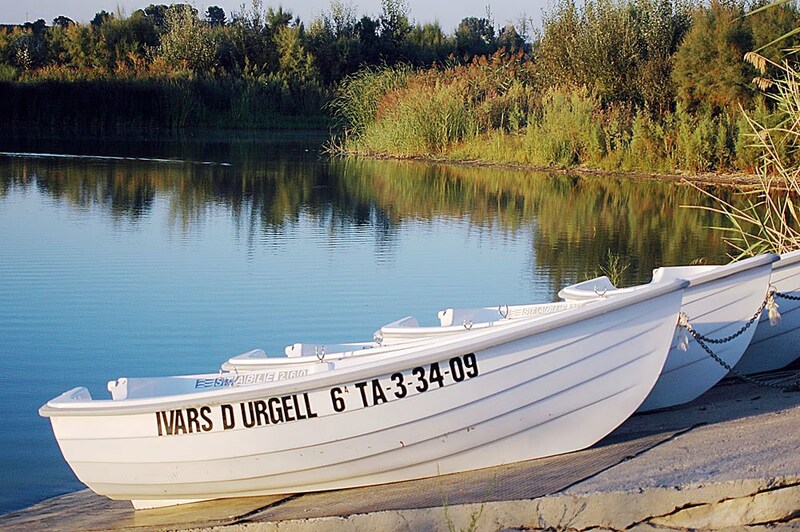 At the same pond you can rent boats to see from a different perspective or even rent bicycles. Please check schedules and fares. To avoid losing any detail, you can arrange tours of the lake by phone 973 71 13 13 or visit the website www.estanyivarsvilasana.cat. If you want other activities around the lake, visit Casa Museo del Canal or Canal d’Urgell and the Museum of Paper dresses, both located in the city of Mollerussa. – A tractor Feast held on 17 January in honor of San Antonio Abad. Early in the morning bless popular rolls and then held Mass at the altar in Santo. Leaving Mass invites all attendees to savor the traditional cake sugar accompanied by muscatel. At 12 am the starting signal is given to traditional Three Tombs at Market Square , where pets are blessed, the floats have prepared the neighbors for many days, and tractors agricultural machinery. The party ends at noon with lunch and dancing in the municipal hall. 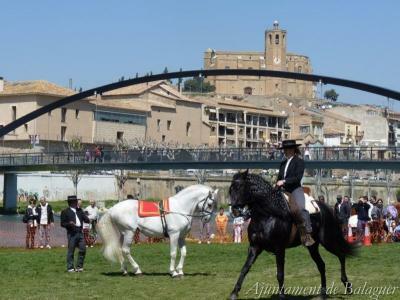 – A horse, is held the second weekend of April. Tres Tombs festival Horse Balaguer was born the day in a group of riders and friends gathered for a celebration of the horse, to make a unique and different party, and that all people the nearby regions of the world could enjoy horse of their shows and their sports more closely. Plasticomusical a show, held at the Castle of Balaguer Formós Easter, designed like a sculpture where actors do not speak, and it is for this reason that the story told by other means. 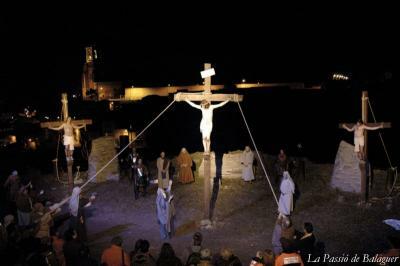 Experience the passion, which is known as the show is represented in detail the suffering of Jesus, the last twelve hours of his earthly life. It comprises 13 paintings that make living with magic realism and fantasy Gospel narratives of the last stage of the life of Christ. It begins at a moment of joy as popular is the triumphal entry into Jerusalem and ends in another made glorious resurrection. In between scenes are endearing as the last supper, sweet moments of compassion like Veronica and Cyrene … especially intense moments of pain and injustice that culminate in the picture of the crucifixion. 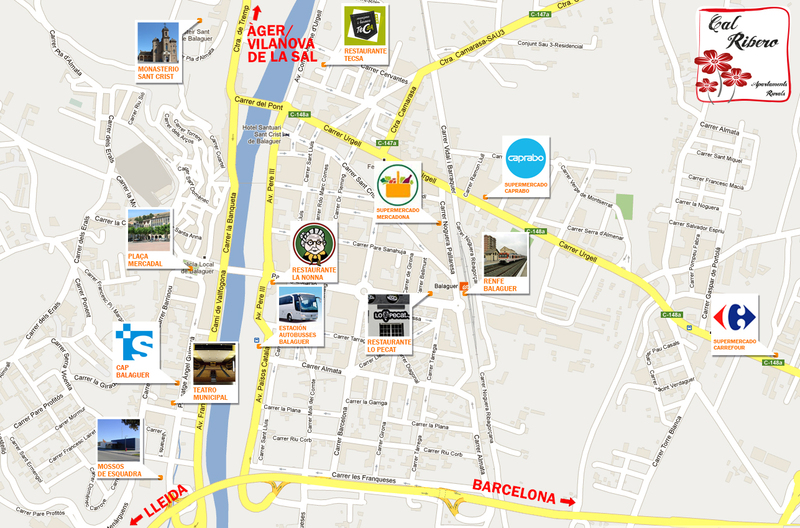 Check schedules and more information on the web: www.viulapassio.cat. The Moors and Christians is a festive recollection of the battles and struggles between Moors and Christians during the Reconquest. The festival is characterized generally by taking the city by the Moors, which remains under the sovereignty overdue for one or more days, until the Christians conquer it again, remaining in the hands of Christians throughout the year until next week party. Balaguer Fair is fair trade and service excellence in the city … For more information please visit the website:www.balaguer.net. 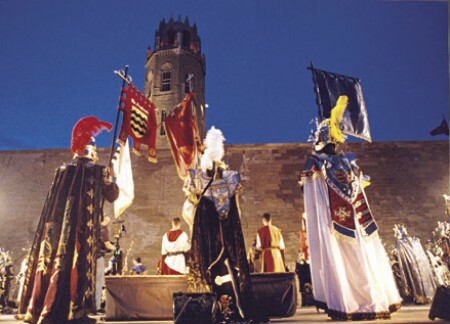 Celebrations are held in about 10-11 May in honor of Saint Anastasi, a Christian martyr who was born in Lleida, was part of the Roman legions and was executed because of their beliefs, the beaches along Badalona with three of his co-religionists. Both cities have it as standard and devote their most important festivals, also called May Festival or Spring Festival. For more information please visit the website: www.paeria.es. 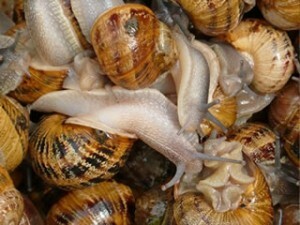 The Gathering of Caracol de Lleida is a gastronomic festival organized around the kitchen of the snail held in the city of Lleida in late May. 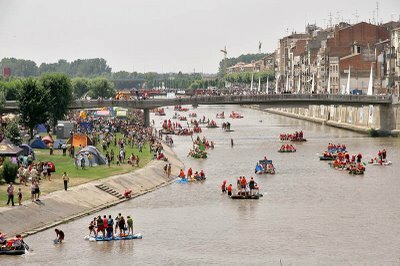 Declared a festival of national tourist interest, has its origins in 1980 in a first twisted held by a group of friends over the River Segre. Find all the information you need on the web: www.aplec.org. Transsegre is the most important festival known all of Lleida has become almost at a summer festival group that develops the city of Balaguer. Heat, water, unbridled imagination and a festive atmosphere are the main ingredients of this festival, a celebration that calls for the recovery of the natural river by a decline crazy and competitive every year brings together more participants enthusiastic about original constructions craft. The race lasts two days crazy. The first part of the tour begins on Saturday afternoon in an atmosphere of joy. The boats leave Camarasa reservoir and begin the descent to the beach calm waters of St. Lawrence. 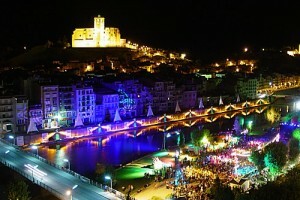 At night, the Park Transsegre every year is a great party accompanied with a show that opens Transsegre, and a great concert that lasts until dawn. Sunday, celebration aquatic continues. What are you waiting? Choose your boat and go ahead to Transsegre! Find all the information you need on the web: www.transegre.org. 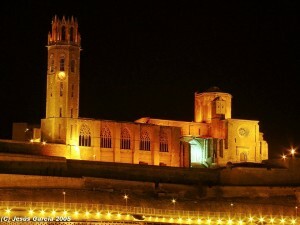 Also called the Fall Festivals, Lleida offers a wide range of recreational activities, sports, musical and cultural in general these days of celebration. Celebrations of the Fall have a distinctly traditional and popular with courting popular Sardana, dancing poles, habanera, the Great Night of Beasts and Fire, traditional dances and other artistic expressions, giants or the towers as exponents. The Feast of the Holy Christ festivities are dedicated to the patron saint of Balaguer, with religious activities, musical, cultural, sports and folklore.